UMSC is a premier soccer development club based in Markham, Ontario. Our Competitive Program is one of the largest and highest ranked in Ontario. Our teams compete at the highest levels and we recently were one of 19 clubs in all of Ontario to be selected to be part of the OPDL - Ontario Player Development League. All of our competitive teams are knows as “The Strikers” and our official club colours are Red, White and Black. All UMSC competitive technical staff and coaches must have the age appropriate OSA coaching certificates, MED and RIS as outlined in the in the OSA Development Matrix. U8-U12 is a development age, all players must have equal playing time. Pre-Registration Requried. Please visit www.u-msc.com to register. Questions? Please email all questions to umsctrainingprograms@gmail.com. All updates will be posted on the website and emailed to those that have registered. Please bring a soccer ball and wear indoor cleats for the trials. Please check in 15 minutes prior to start of session. 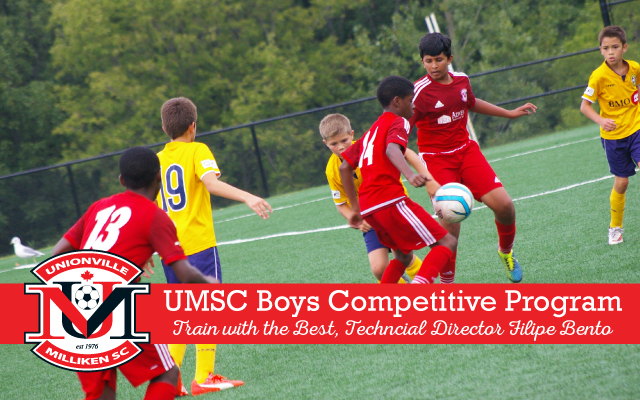 Interested in trying out for one of the UMSC Boys Competitive Teams?